Kyle Alexander Kuzma, well-known as Kyle Kuzma is an American professional player who plays as a power forward/small forward for the Los Angeles Lakers. Prior to turning professional, Kuzma played college basketball for Bentley and was picked 27th overall in the 2017 NBA draft by Brooklyn Nets. Kuzma earns about $1.6 million as salary from Lakers in 2019 and has an estimated net worth of $5 million. He is currently dating his girlfriend Katye Elise Henry. As of 2019, Kyle Kuzma has an estimated net worth of $5 million including all of his properties and earnings. Currently, under a 3 year $5,088,000 contract with the Los Angeles Lakers, he has an annual salary of $1,689,840 from his present club in 2018-19. He will earn $1,974,600 as an annual salary in 2019-20. Further, he also has 2-year option to stay with the club and will be paid $3,562,178 and $5,282,711 for the next two season respectively. LeBron James is the highest paid player in the club with an annual salary of $35 million. The 22 years old Los Angeles Lakers star has recently signed an endorsement deal with Nike. Recently in October, he signed a deal with GOAT being the first brand ambassador. GOAT is the world's largest marketplace for authentic sneaker and Kyle will be wearing the NIKE shoes provided by GOAT, on and off the field. Moreover, he has also signed a deal with Budweiser. Earlier in 2018, Kyle bought his first car, a Porsche. Besides, he also has a '70 Cadillac DeVille for riding. Kyle Kuzma is not married yet. However, he is dating his girlfriend Katye Elise Henry. The couple has been dating each other for a couple of months. Ladies! Trust me I know my leggings. I onnnnly wear the best/most flattering material these are @ehplabs leggings! use code • KATYA10 • to save 10% off entire website. woo! Kyle's girlfriend Katye recently came into limelight after she trolled one of Brandon Ingram's girlfriends named Raelynn Inez. Katye Elise Henry trolled Inez by showing her that Kuz got her and her friend tickets in the 100s sections while Inez is still stuck in the 200s. Inez is a stripper at Crazy Girls in LA. Ingram is said to have kept her there to keep her out from his family and friend's sight. Katye is an Instagram fitness model and has around 5 million followers on her Instagram account. She is reported to have dated several other athletes in the past. He is very close to his mother Karri. He has an unbreakable bond with his mother. His mother got pregnant when she was a student of Hillsdale College on a track scholarship in the 1990s. Kuzma's mother ended her career, left her college and dreams what she waved, and started her life as a single parent. Kuzma has a perfect persona and a great athletic ability. He has a gigantic height of 6’9”, which is around 2.06m. He has a balanced weight of 101 kg. 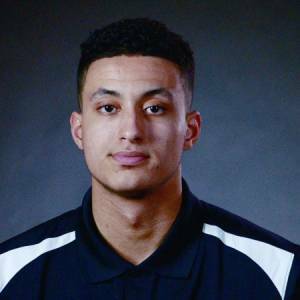 Kyle Kuzma was born on 24 July 1995, in Flint, Michigan, the United States to an American parent, Karri Kuzma. He holds an American nationality. Born in late July, his zodiac sign is Leo. His mother Karri was a high school shot put champion. His father left his mother while he was an infant and married another woman. He has a younger half-brother and a sister named Andre and Briana. His mother later got married to Larry Smith who is a father figure to him. Kyle attended Swartz Creek Community Schools then transferred to Bentley High School. Since his childhood, Kuzma developed a true dedication and devotion towards the game basketball. He decided to become a basketball player, and his parents equally supported his decision. Kyle Kuzma went to Bentley High School before transferring to rising Academy in Philadelphia. Upon high school graduation, Kuzma enrolled at the University of Utah in 2013. He played outstandingly during his college years. In sophomore and junior years, he had 16.4 points per game and had 9.3 rebounds and 2.4 assists as a contest. For his remarkable efforts, Kuzma was recognized with 2017 All-Pac-12 First-Team honors. After the 2016-17 Campaign, Kunza forewent his senior year and entered the 2017 NBA draft. He later graduated from the university with the degree in sociology. Kuzma was drafted into the NBA by the Brooklyn Nets as the 27th overall NBA draft. That same day, he along with Brook Lopez traded to Los Angeles Lakers, in exchange for D’Angelo Russell and Timofey Mozgov. On July 3, 2017, Kuzma agreed on a $1.4 million rookie-contract with the Lakers along with Derrick Williams and Lonzo Ball. He played seven games in 2017 NBA Summer League and averaged 21.9 points, 6.4 rebound, 2.7 assists, and 1.4 blocks per game. On November 3, 2017, he appeared as a starter in the match against Brooklyn where he recorded a double-double with 21 points and 13 rebounds. In 20 games, he averaged a team-high 16.7 points. He was also named to the NBA All-Rookie First Team in MAy 2018. In the 2018-19 season, Kuzma has so far averaged 16.7 points, 6.1 rebound, 1.9 assists, and 0.5 blocks per game.